It was a busy weekend. 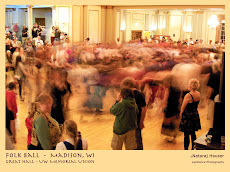 I would normally have been attending Mazopalooza - a contact improv event in nearby Mazomanie, WI - but choices about Life, the Universe, and Everything kept me away. Sort of. Friday the participants spend a portion of their day blocking a show for that evening. It is all improvisational, so scores are proposed and experimented with, then quickly deemed "ready". There is a brief tech run to establish lighting, and then the doors open for a free performance for friends, family, and the local residents. Being a spectator instead of a performer was an interesting variation for me. I found the show to be entirely enjoyable, quirky and often humorous, and yet occasionally quite poignant. The lighting was different this year from year's past, and some of the lights used were LEDs. I noticed at a show last summer that the LEDs created havoc with the digital video cameras that were used. My own experience was similar. I hope that is not a sign of lighting mischief that digital camera shooters will have to deal with forever! Other color choices did not have the same effect. There are a lot of talented movers in this community (drawn from a number of Midwestern cities: Madison, Chicago, Milwaukee, Minneapolis, Ann Arbor, and Lafayette, IN, and a few others from farther afield) so it is delightful to watch what they come up with on the fly. Not everything goes right, but everything goes well. 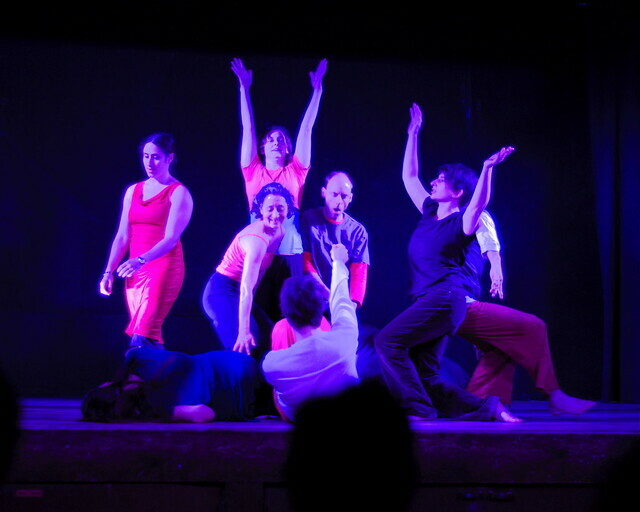 The next day I returned to the event as a guest musician, with three others, to provide improvisational music to accompany their improvisational dance. While I did sneak out from that role to have a delightful dance with an opalescent woman from Canada, mostly I intently watched and provided music. It was a fun and challenging collaboration to remain sharply present and let the goings-on in the room inform my/our choices of rhythm, volume, and melody (or lack thereof). For not being at Mazopalooza, I sure had a good Mazopalooza experience! There are three-score photos in a SLIDE SHOW for your enjoyment.